Coal was formed about 300 million years ago. 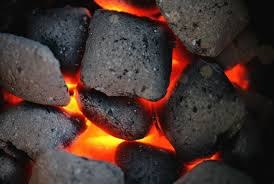 Coal is a combustible mostly black sedimentary rock composed mostly of carbon and hydrocarbons. Coal takes a million years to create and therefore it belongs to non-renewable energy sources. Coal mining uses two methods: surface or underground mining where surface mining is more dominant method because it is less expensive than the underground mining. Coal is mostly transported by train. Coal as the other fossil fuels as well isn't ecologically acceptable because of CO2 and global warming. Coal is classified into four main types: lignite, subbituminous, bituminous, anthracite and the coal value is determined by the amount of the carbon it contains. Coal is mined in 27 US states. Coal is mainly used for generating electricity (more than 90 % of US coal). Coal usually has a negative impact on environment, mining can damage ground and surface waters and when coal burns as the fuel it releases CO2 which is the main greenhouse gas that causes global warming. Coal is so called "dirty" energy source because of its negative effect on environment. Coal could be the world's most attractive fuel in years to come thanks to the methods of coal purification which are resulting in more cleaner coal, removing sulfur and other dangerous elements. Coal is used on the large scale in China and USA. Coal can be answer for future only if technology will enable "ultra-clean" coal. Coal must be relatively dry before it can be burned successfully. World coal consumption is more than 5.3 billion tons annually of which three quarters are used for generating electricity. Coal was already used in the Bronze age (Britain). Coal's share in the total world electricity production is about 40 %. Coal deposits could be enough to satisfy current world energy needs for the next 300 years. Coal is getting more attention because of the increased prices of oil and natural gas. Coal can be converted like to gasoline or diesel by couple of different processes like for instance the Fischer-Tropsch process, Bergius process and Karrick process. Coal is the official state mineral of the Kentucky and official and the official state rock of Utah. Coal total reserves are approximately about 1 × 1015 kg or 998 billion tons. Coal is mined in more than 100 countries. Coal is the main reason for China's economic boost as for China's environmental problems. Coal is made largely of carbon but also features other elements such as hydrogen, oxygen, sulfur and nitrogen. Coal starts off as plant matter at the bottom of water. It is eventually covered and deeply buried by sediments where over time metamorphosis (a change in form) takes place. Different types of coal contain different amounts of carbon. Lignite contains only around 60 to 75%, while anthracite contains more than 92%. Anthracite is a hard, shiny, black coal that burns with a blue, smokeless flame. While most forms of coal are associated with sedimentary rock, anthracite undergoes metamorphism and is linked to metamorphic rocks. Coal has long been burned to create electricity and heat. The use of coal is increasing every year, in 2006 the world consumed over 6,000,000,000,000 kilograms of coal! Coal is the world’s largest source of energy for the production of electricity. Coal is converted to electricity by being burned in a furnace with a boiler. The boiler water is heated until it becomes steam, with the steam then spinning turbines and generators to create the electricity. Nearly 70% of China’s electricity comes from coal. In total, coal produces around 40% of the world’s electricity. A popular saying among many cultures is that if you behave badly during the year, Santa will deliver you a lump of coal for Christmas. Coal has been used as an energy source for hundreds of years and was part of international trade in as long ago as the Roman Empire. Coal provided the energy which fueled the Industrial Revolution of the 19th Century and also launched the electric era in the 20th Century. Coal is by far the cheapest source of power fuel per million Btu, averaging less than half the price of petroleum and natural gas. The world's iron and steel industry depends on the use of coal. The value of coal produced in the United States each year is nearly $20 billion. Coal is directly responsible for the existence of more than 90,000 U.S. jobs and nearly one million jobs directly and indirectly. Coal mining has a combined direct and indirect impact of $161 billion annually on the U.S. economy. This is $596 for every U.S. citizen. The federal government receives more than $11 billion annually in taxes and fees from the coal industry. State and local governments receive nearly $9 billion each year in revenues. Developing countries' demand for coal will double through 2020, according to the Energy Information Administration (EIA). Coal reserves are spread over almost 100 countries. Proven coal reserves are estimated to last over 200 years with current production rates. In contrast, proven oil and gas reserves are equivalent to around 40 and 60 years. America's coal is used primarily for the production of electricity. There were 315,000 Megawatts (net) of coal-based electrical generating capacity in the United States. Some 965 million tons of coal were consumed for the generation of electricity. This amounted to 86% of total U.S. coal production.